A fabulous fall recipe you can serve with dinner any night of the week. Kids love the vibrant color and salty/sweet flavors. Depending on its size, one squash should be enough for one meal that serves 4-6. 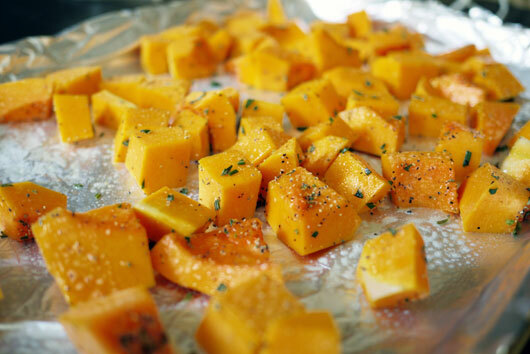 You can also freeze roasted squash, so make extra if you’re not sure! Step 1: Preheat oven to 375 degrees. Using a large chef’s knife, cut off the stem and carefully cut the bottom or side of your squash so that it will sit stable on your counter. (Depending on the size or shape of the squash, you may need to cut it in half first.) Use the knife to cut away the thick skin. Once all of the skin has been “peeled” and discarded, cut the squash into 1-inch cubes. Step 3: Bake in preheated over for 45-60 minutes, until the squash is fork tender all the way through and caramelized in spots. Remove from oven and allow to cool completely before packing in an airtight container for storage in the fridge (for up to 5 days) or freezer (for up to 3 months).